Avery Publishing Group, 9781594631542, 304pp. Karl Pillemer s 30 Lessons for Living first became a hit and then became a classic. Readers loved the sage advice and great stories from extraordinary older Americans who shared what they wish they had known when they were starting out. Now, Pillemer returns with lessons on one of the mosttalked- about parts of that book love, relationships, and marriage. Based on the most detailed survey of longmarried people ever conducted, 30 Lessons for Loving shows the way to lifelong, fulfilling relationships. The author, an internationally renowned gerontologist at Cornell University, offers sage advice from the oldest and wisest Americans on everything from finding a partner, to deciding to commit, to growing old together. Along the way, the book answers questions like these: How do you know if the person you love is the right one? What are the secrets for improving communication and reducing conflict? What gets you through the major stresses of marriage, such as child-rearing, work, money issues, and inlaws? 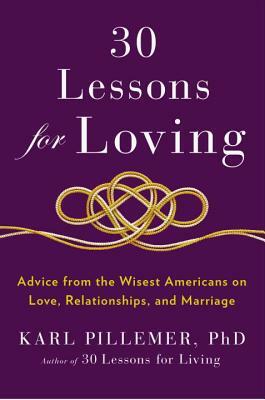 From interviews with 700 elders, 30 Lessons for Loving offers unique wisdom that will enrich anyone's relationship life, from people searching for the right partner to those working to keep the spark alive after decades together. KARL PILLEMER, PHD, is the founder and director of the Cornell Institute for Translational Research on Aging, a center that works to increase public awareness of aging research. Dr. Pillemer has authored more than one hundred scientific publications and has spoken widely throughout the world on issues of successful aging, family relationships, and elder care. He is also the author of30 Lessons for Living."